Never has there been a time when the need to research the ecological mechanisms of the world has been so urgent. Gathering data and making informed deductions from that data is the stuff of science and will enable a greater and increasingly more nuanced understanding of the many fragile and threatened habitats that we have in the UK. Only by doing this can we make informed decisions in relation to the management and conservation of these habitats and the organisms that depend on them for survival. Several studies have been carried out recently, interpreting data gathered from the nightjars by electronic equipment attached to the birds. Some of these have looked at the movements of the birds within foraging areas over the short term, and others have had wider scope, attempting to look at the bird’s annual cycle of migration and unlock some of the mysteries surrounding that phenomenon. 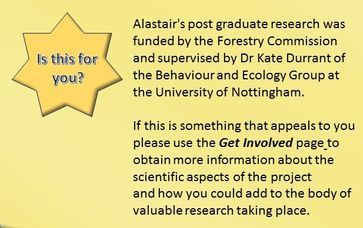 Click the button to read Georgina's description of the work she is doing investigating the impact of human disturbance on nightjars. Dr Kate Durrant spoke at this event on the movement ecology of nightjars., sharing the latest updates and future directions of the Sherwood Nightjar Project with the European nightjar research community. Effect of human disturbance on long-term habitat use and breeding success of the European Nightjar, Caprimulgus europaeus. Three main types of tracking equipment have been used depending on the scope and scale of the study and the budget available. These are light loggers that record light intensity every 10 minutes. From this latitude and longitude can be calculated so giving the position and track of the bird. Lightweight and inexpensive - use little power, so even a 2g device has a 2-4 yr battery life. Useful for gathering data on small birds. Prone to shading - therefore dawn and dusk times cannot always be calculated. Can be rather imprecise. They do not work for latitude at the equinox. These record the time taken to send and receive a signal from an array of satellites. They can provide accurate positioning of the bird over time by taking fixes at intervals. A 2g device can take 40 fixes before batteries expire. They can be accurate to within 4 meters. Until recently these devices were not lightweight and quite expensive. Battery life was an issue but this has improved. Lighter versions are being developed. These tags emit a VHF radio signal that can be picked up by a hand held receiver in the field. Use little power. Good for finding animals and birds, not so good for working out what they are doing. Relatively expensive set up because of the cost of the receiver; although tags are inexpensive and last. These have the features of both GPS and VHF tracking. This device was used in the Sherwood Nightjar Project. Accurate - taking 40 fixes in a single evening. Need to be attached to bird by a harness (for longer deployment). When attached to tail feathers will be lost at moult. At The University of Nottingham I have been studying the behaviour of the European nightjar (Caprimulgus europaeus) by using GPS data loggers and monitoring breeding attempts. The field work was led by Birklands Ringing Group during which thirteen GPS data loggers were retrieved from nightjars and forty-eight nests were located and monitored. The relationship between movement and breeding behaviour was found to have potential implications for current nightjar survey methods. Results suggest that roaming unpaired males could lead to an over-estimate of the population due to large movements and increased activity. The total area used by individual nightjars was large when compared with the area where they spent 50% of their time. This was a result of movement into the broader landscape away from nest sites. Habitat selection analysis showed that within the forest nightjars preferred newly planted coupes (aged 0 – 4 years), open canopy plantation forest (aged 5 – 9 years) and areas of heath. In non-forest habitats nightjars appeared to visiting sites with livestock, travelling distances of over 1km to do so. This provides an indication that nightjars are vulnerable to changes in land use and farm management practices. 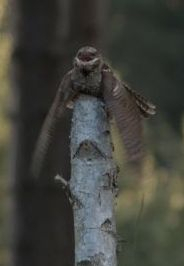 Nightjars, like many birds, are very sensitive to disturbance when nesting. In this study it was found that the presence of a footpath near a nest and the number of footpaths in the close proximity had a negative impact on the breeding success of nightjars. Results from nest temperature data loggers indicated that increased diurnal disturbance was related to unsuccessful nests. Much of Sherwood Forest is fragmented and surrounded by human settlement, understanding and mitigating the effects of disturbance on nightjar breeding success will be important for the future of the species.